Meningitis is an uncommon complications of head trauma. Vasculitis in bacterial meningitis is seen in 9%–25% of adults. Neurological deficits in bacterial meningitis are seen in about one-third of children. Isolated cranial nerve palsies are common, whereas major deficits such as hemiparesis and quadriparesis are rare. 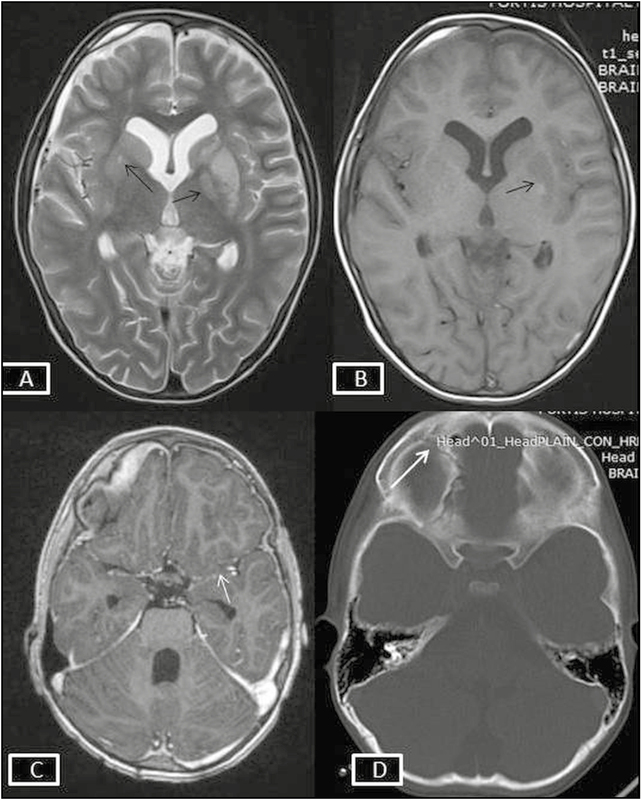 We describe a case of a 7-year-old boy who had post-traumatic meningitis complicated with quadriparesis and severe vasculitis of bilateral anterior and posterior circulation with moyamoya vasculopathy. Meningitis is a rare complication of moderate-to-severe head trauma seen in 1% cases. Vascular complications in bacterial meningitis are seen in 9%–25% of patients. Neurological deficits in bacterial meningitis occur in one-third of children, with majority having cranial nerve palsies. Hemiparesis occurs in one-third of children with deficits. Quadriparesis is rare. Moyamoya syndrome is arteriopathy of internal carotid artery due to secondary causes such as autoimmune conditions, infections, metabolic disorders, and neoplasms. The term moyamoya vasculopathy refers to the distinctive angiographic appearance irrespective of the cause. We discuss the case of a child with post-traumatic pyogenic meningitis characterized by basal meningitis, extensive vasculitis, and moyamoya vasculopathy. A 7-year-old boy presented a history of fall from first floor of a building followed by seizures and unconsciousness. Computed tomography (CT) showed fracture of right frontal bone extending up to superomedial aspect of right orbit. The child regained normal sensorium within 48h. On day 3, he started to have high-grade fever and progressive deterioration in sensorium with neck stiffness. Cerebrospinal fluid (CSF) analysis showed 1920 cells (100% polymorphs), glucose 6mg/dL (blood glucose 141mg/dL), and proteins 143mg/dL. Gram stain showed gram-positive cocci and culture was sterile. He was started on vancomycin and ceftriaxone. Encephalopathy improved by 72h, after which he was noticed to have quadriparesis (right > left) with left upper motor type of facial palsy. Magnetic resonance imaging (MRI) of the brain showed infarcts in right frontal, bilateral caudate and gangliocapsular regions (left > right), left frontotemporal regions, and left cerebellar hemisphere; diffuse leptomeningeal enhancement; and mild hydrocephalous [Supplementary [Figure S1] and [Figure S2]]. 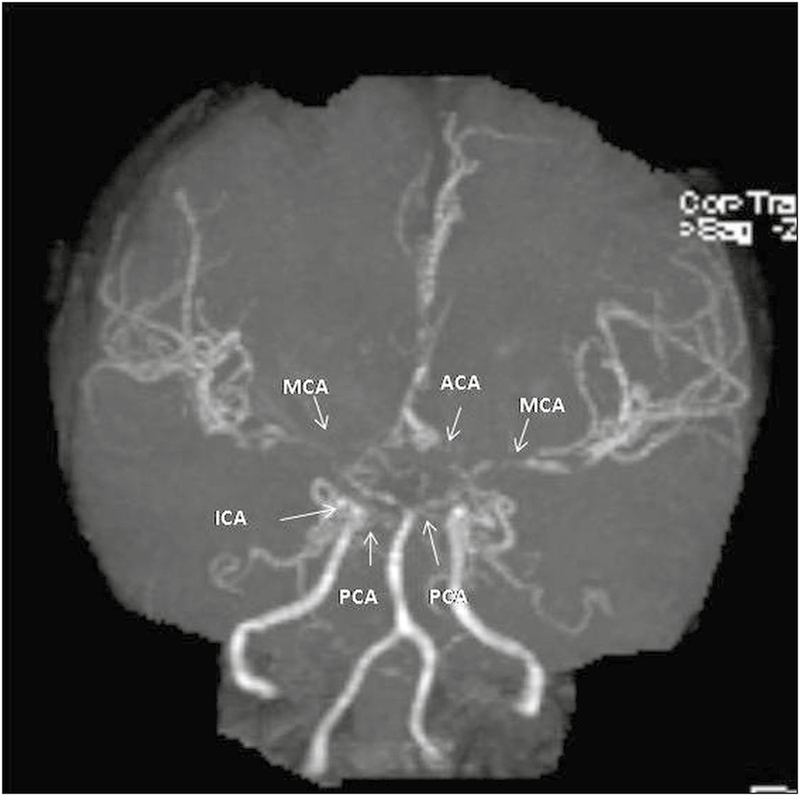 Magnetic resonance angiography showed diffuse irregular narrowing of supraclinoid parts of both internal carotid arteries (ICAs), bilateral proximal middle cerebral artery (MCA), and anterior and posterior cerebral arteries (PCAs), suggestive of moyamoya vasculopathy [Figure 1]. The child continued to have high-grade fever for 25 days. He was treated with vancomycin and meropenem for 42 days (based on serial CSF analysis). CSF analysis for acid-fast bacilli, Cryptococcus, Acanthamoeba, and triple antigen screen and fungal cultures were unremarkable. The results of liver and renal function tests, echocardiography, lipid profile, and homocysteine (serum, urine) were within normal limits. At discharge, the child was conscious, quadriparetic (right > left), and able to speak one or two words. After 5 months of follow-up, he can walk with support, has right hemiparesis, can speak 20–50 words, and has reflex auditory seizures. He was given low-dose aspirin for 6 months. Severe head trauma manifests as fractures and extradural, subdural, and intraparenchymal hemorrhage or diffuse brain injury. Meningitis is a rare complication seen in 1% of patients with head trauma. Meningitis complicating head trauma is often associated with cerebrospinal leak from cribriform plate or temporal bone manifesting as rhinorrhea or otorrhea. This child highlights a rare presentation of bacterial meningitis with extensive vasculitis involving bilateral anterior and posterior circulation and moyamoya vasculopathy. Vasculitis in bacterial meningitis is seen in 9%–25% of adults. Inflammation of arteries can cause luminal narrowing due to endothelial cell swelling, subintimal proliferation, luminal necrosis and thrombosis. This is exacerbated by transient vascular spasm due to autoimmune process triggered by infection. A complex proinflammatory cascade caused by release of products such as bacterial proteins, cell wall polysaccharide, and free radicals causes blood–barrier disruption and worsening of meningitis, which further worsens vasculitis. Stroke secondary to meningitis commonly occurs 4-14 days after the onset of meningitis as in the index case. Pugin et al. have described an adult with recurrent stroke due to involvement of posterior and middle cerebral arteries triggered by pneumococcal meningitis. Though no organism was cultured in the index case, the presence of gram-positive organisms suggests streptococcal or staphylococcal infection, especially in view of recent skull fracture. Vasculitis in meningitis is commonly seen in cases of Haemophilus influenza meningitis. In a series of postmeningitis vasculitis, 9 of 12 patients had involvement of supraclinoid arteries, 6 of which were caused by Haemophilus. Pfister et al. have described stroke due to supraclinoid ICA involvement caused by Streptococcus viridians and pneumococcus in 2 of 86 adults with meningitis. Postmeningitis moyamoya vasculopathy has been described in cases of Streptococcus pneumoniae, Mycobacterium tuberculosis, Neisseria More Details meningitides, human immunodeficiency virus, H. influenza, and Mycoplasma pneumoniae in isolated case reports. Moyamoya vasculopathy in the index case may be due to basal meningitis. Moyamoya vasculopathy has been described with basal meningitis due to tubercular meningitis and suprasellar tuberculomas.,The extensive vascular network in the circle of Willis makes these arteries susceptible to infection and inflammation. 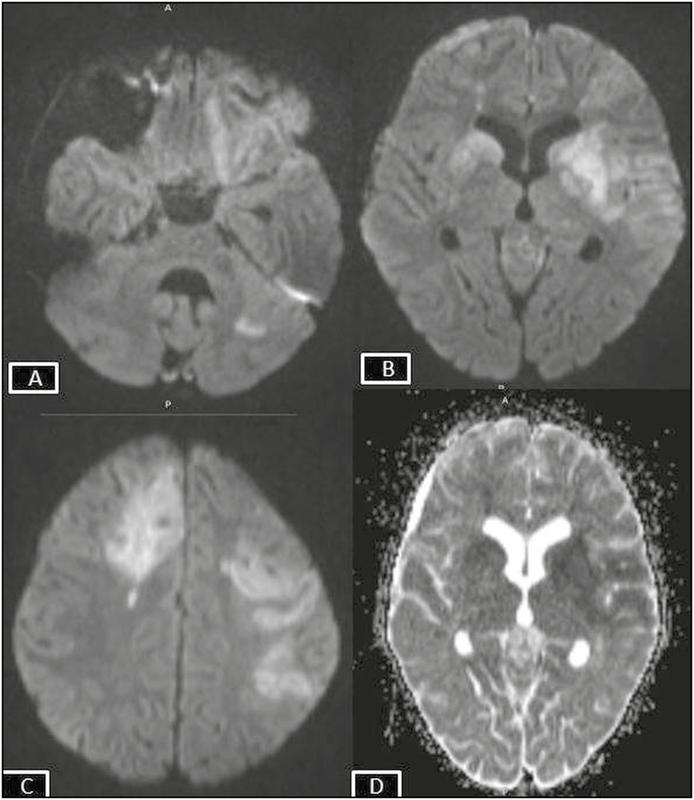 Acute moyamoya phenomenon has been described after acute vascular narrowing due to subarachnoid hemorrhage. The timely and prolonged treatment of meningitis in the index case prevented worsening of vasculitis in the index case and the child improved during the course of treatment. In conclusion, pediatricians and pediatric neurologists should be aware of vascular complications such as vasculitis and moyamoya vasculopathy, which can be seen rarely with pyogenic meningitis. An informed consent form was signed by the parents of the patient to approve the use of patient information or material for scientific purposes. Fugate JE, Lyons JL, Thakur KT, Smith BR, Hedley-Whyte ET, Mateen FJ. Infectious causes of stroke. Lancet Infect Dis 2014;13:869-80. Pomeroy SL, Holmes SJ, Dodge PR, Feigin RD. Seizures and other neurologic sequelae of bacterial meningitis in children. N Engl J Med 1990;13:1651-7. Scott RM, Smith ER. Moyamoya disease and moyamoya syndrome. N Engl J Med 2009;13:1226-37. Baltas I, Tsoulfa S, Sakellariou P, Vogas V, Fylaktakis M, Kondodimou A. Posttraumatic meningitis: bacteriology, hydrocephalus, and outcome. Neurosurgery 1994;13:422-6; discussion 426-7. Pugin D, Copin JC, Goodyear MC, Landis T, Gasche Y. Persisting vasculitis after pneumococcal meningitis. Neurocrit Care 2006;13:237-40. Igarashi M, Gilmartin RC, Gerald B, Wilburn F, Jabbour JT. Cerebral arteritis and bacterial meningitis. Arch Neurol 1984;13:531-5. Pfister HW, Borasio GD, Dirnagl U, Bauer M, Einhäupl KM. Cerebrovascular complications of bacterial meningitis in adults. Neurology 1992;13:1497-504. Pinardi F, Stracciari A, Spinardi L, Guarino M. Postpneumococcal moyamoya syndrome case report and review of the postinfective cases. BMJ case reports 2013;13:bcr2012006726. Kumar RM, Saini L, Kaushik JS, Chakrabarty B, Kumar A, Gulati S. A combination of moyamoya pattern and cerebral venous sinus thrombosis: a case of tubercular vasculopathy. J Trop Pediatr 2015;13:393-6.